Delhi has no dearth of fine dining restaurants and cafes. And when it comes to Hauz Khas Village (HKV), it’s the ‘baap’ of all food scenes. From cafes to restaurants and pubs, it has everything. Whether it’s the tiredness after a stroll of the Fort and Deer Park or simple foodie cravings, HKV caters to all your needs. 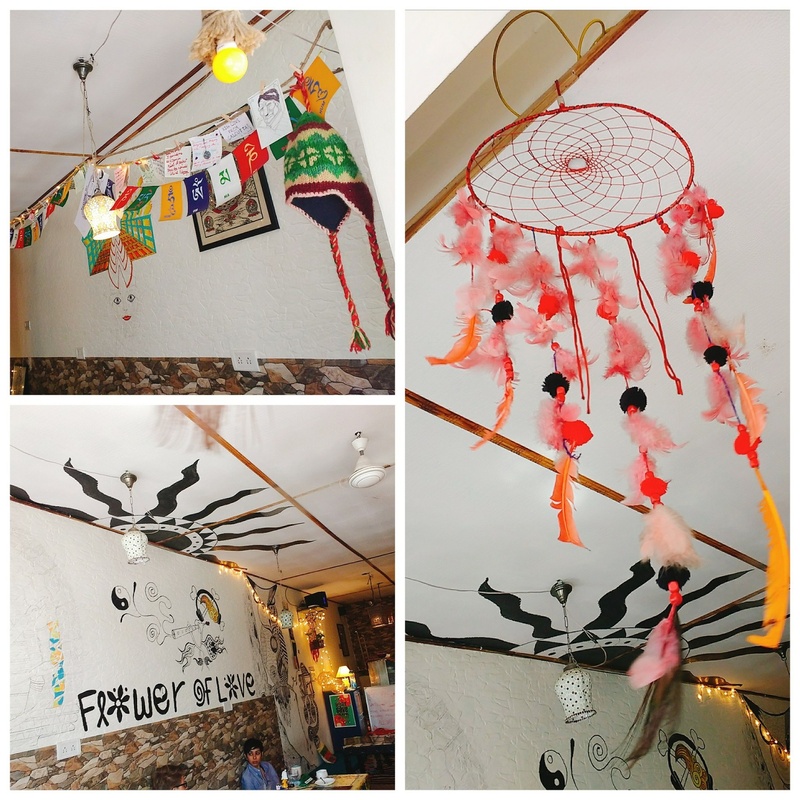 While it is more popular for its vivacious nightlife, HKV also houses some hidden gems like The Hippie Trail which completely change your perception of the area. It may be difficult to locate on the first visit since it is tucked away from the main lane. It is in the same lane as Hauz Khas Social; just a few steps further. As soon as you enter, you will fall in love with the place. It has a very chilled out vibe. This is one place in Delhi where you can strut in wearing your most ridiculous PJs and not be judged by anyone. Such a place is bound to become your favourite hangout spot. Overlooking the tank, The Hippie Trail is a personification of comfort. It has a floor seating arrangement with comfy moda stools and cushions. My favourite spot is the window seat from where one can have a mesmerizing view that soothes the senses. The walls are painted with funky designs that give a bohemian look to the place. The striking dream catcher near the window seat deserves to be clicked). The servers are very genial. The menu is quite simple yet full of lip smacking dishes. We went for a Masala Chai to begin our culinary expedition. Unlike popular cafes where the tea is served in tiny little cups, the chai here was served in big tea/coffee mugs. The quantity was heartening. 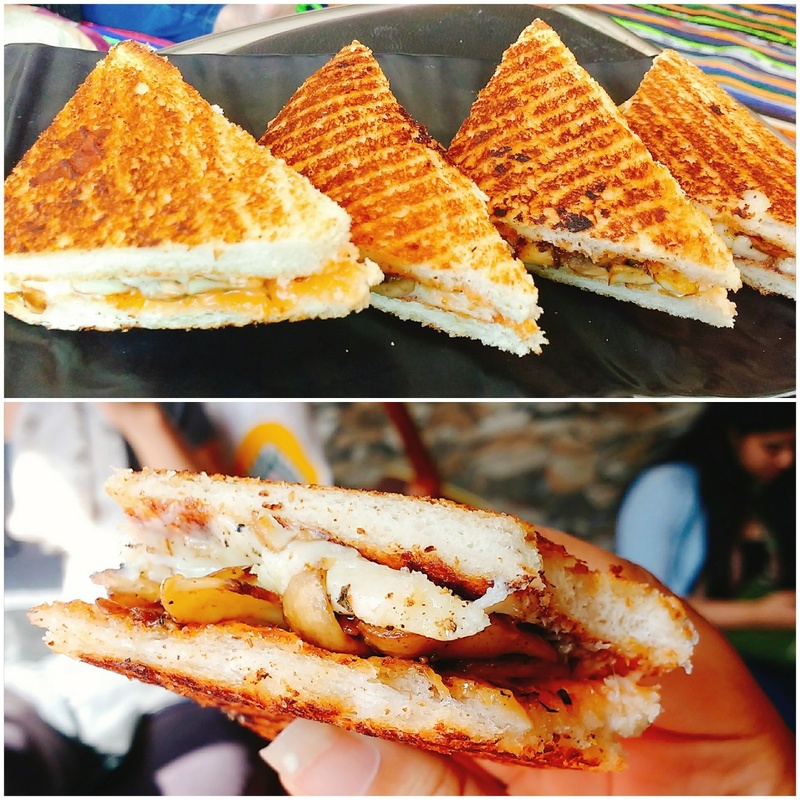 The Mushroom and Cheese Sandwich was the perfect partner to a cup of Masala Chai. Fleshy Mushrooms and oodles of cheese are sure to lift up your spirits with their scrumptious flavours. I really wanted to have Pancakes but it wasn’t included in the menu. The kind staff made Nutella Pancakes on special request which only goes on to show their congeniality. (P.S. – This was not a Bloggers Meet. The staff was genuinely very accommodating). One plate consisted of two pancakes slathered with a generous amount of Nutella. They were soft, spongy and the Nutella just made it even better. The Hippie Trail is one of those cafes which become your Portkey to peace. Play board games while sipping on your tea or coffee and indulge in great food with a hearty conversation. Or you could just strike up a random tune on the guitar that they have. Live, Laugh, Enjoy. That’s The Hippie Trail for you. London is a melting pot of cultures and a mélange of different lifestyles. People of various ethnicities coexist in perfect harmony. Londoners Bistro and Pub in GK-1 is an embodiment of the cultural conglomeration that London is. While the name may make us think that the place serves purely British food, it also conjures up a blend of cuisines that is quite popular in London. The brainchild of Paritosh Mittal, an engineer by profession, Londoners has a great ambience with vibrant décor and classy upholstery. Blue seems to be the dominant hue in the colour palette. They also have an outdoor seating arrangement, ideal for Delhi’s winters. The menu consists of traditional British dishes as well as those inspired by other cuisines. The basic idea is to represent London, not as isolated with other cultures but in sync with them. This is the reason behind the fusion dishes in the menu. 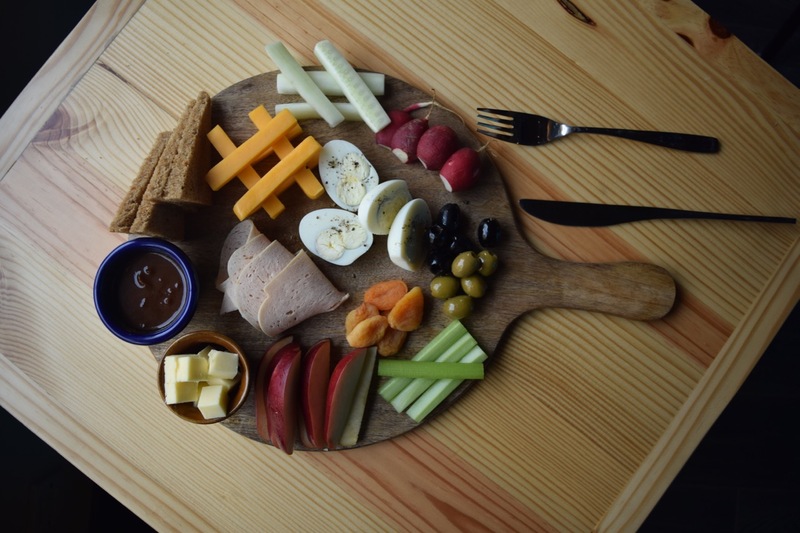 The Bloggers Meet began with a Ploughman’s Platter. 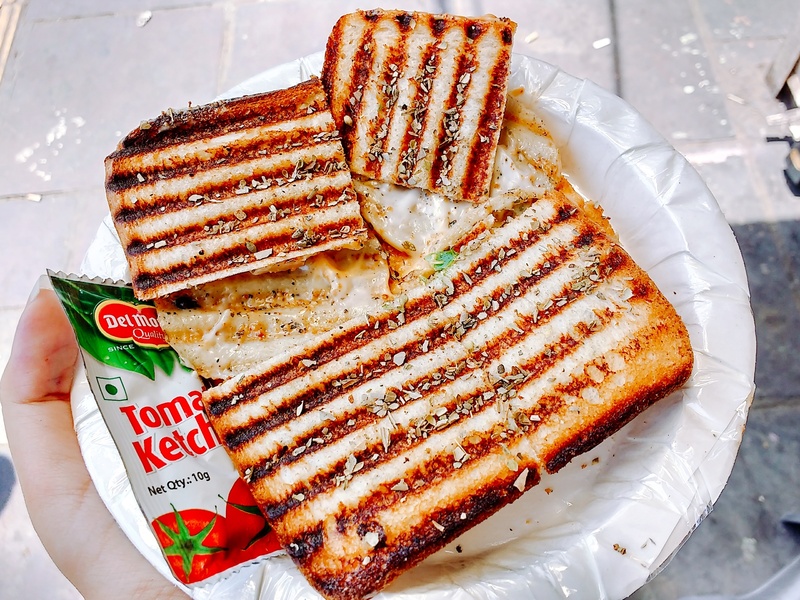 Traditionally, it is a non vegetarian meal but in keeping with the Indian sensibilities, they also provide a vegetarian version with grilled Paneer dices. Workers in London would pack whatever leftovers they had from dinner and take it to work. Therefore, unlike the well organized Indian lunchboxes , theirs would be a muddle of bread, chicken, ham, cheese, etc. 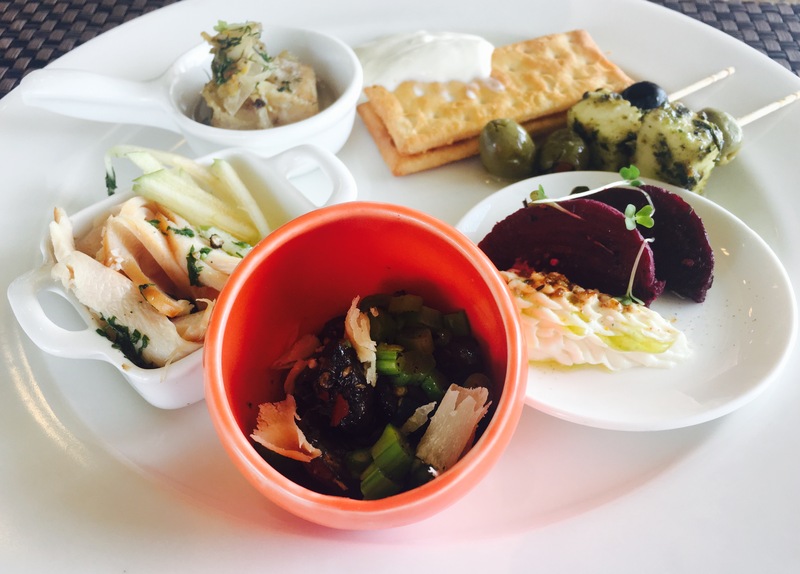 The platter served here included bread, butter, cheese, olives, dried apricots, Brown Onion Sauce slices of apple and cucumber along with boiled eggs or Paneer cubes as per the variant chosen among Veg or Non Veg. Scotch eggs, a British delicacy, is made with hard boiled eggs wrapped in sausage meat and bread crumbs which is baked or deep fried. Here, the eggs are wrapped in Keema giving it an Indian touch. The Irish Spring Rolls were filled with corn and cheese but served along with a sweet and spicy sauce. They were crispy but not very cheesy which was disappointing. The very concept of a Spring Roll and the sauce is Oriental, again reminiscent of the cultural influences in London. The Tikka Masala Platter was a complete meal with Tandoori Rotis, Daal Makhani, Paneer Tikka Masala, Papad, Green Chutney and onions. One platter should suffice two people. The Paneer Makhani Pie, for me, was the star of our meal. Firstly, Pies are sweet but this one was savory. Secondly, while Pies are believed to have been originated as a Roman dessert, this one was a full-on desi rendition, replete with a Shahi Paneer filling. This marvelous invention came with fries and salad. The fries lacked salt and a dip along with it could have done wonders. The Paneer Makhani Pasta brought together Indian and Italian in a dish that packed a punch with authentic Indian flavours. While one may complain about the complete abandon of its Italian roots, I don’t mind it even a bit since it is supposed to be an Indianised version of Pasta. The Clay Pot Pie had a flaky crust on top, like the one that’s usually found in French pastry. The Pie tasted like Au Gratin, only more liquid in consistency and lesser vegetables. The crust tastes best when dipped in the gravy. To wash it all down, try a Blueberry Cheesecake Shake or an After Eight Shake. The Blueberry Shake was perfect in its consistency and presentation (Mason Jars are a huge rage!). Other dishes to look out for are Keema Kulcha and Crispy Konjee Lamb. Among Desserts I tried the Great Wall of Chocolate which was high on taste and the nutty texture but a bit too hard. The Sticky Toffee Pudding was ACTUALLY very sticky. The caramel lent it a nice flavour but it failed to impress with the texture. 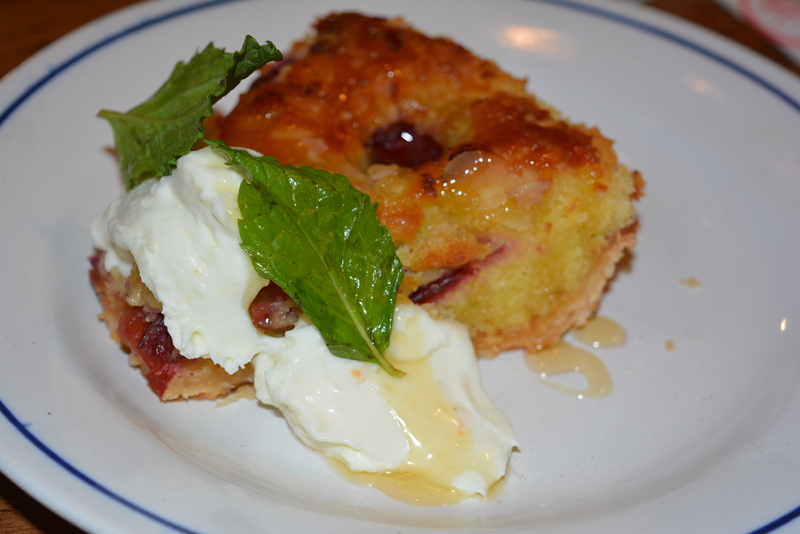 It was the Bread and Butter pudding which stole my heart with its presentation and taste. Not too sweet, the pudding comes in a cup/coffee mug topped with a scoop of ice cream. The contrast of warm and cold was a nice play on the taste buds. This one is a MUST TRY. When you need a break from all the shopping in GK, give Londoners a try. It won’t disappoint you. The Mughal Empire is known for its grandeur reflected by the larger than life architecture, the flamboyant culture and the eclectic artistry. The Mughal emperors also brought with them the fascination for a rich and diverse cuisine, which led to the conception of a variety of dishes that are popular even today. One of the dishes that originated during the last Mughal Sultanate is called Nihari, a slow cooked beef stew eaten for breakfast. First developed in the late eighteenth century, Nihari was a favourite among the Nawabs. It was part of the meal eaten after the Fajr prayer or the Morning Prayer followed by a long nap. Today, Nihari is served mostly in the Old Delhi area, specifically in the restaurants around Jama Masjid and is eaten for lunch and dinner as well. Located in the Matia Mahal lane, near Jama Masjid is a restaurant known for its delicious Nihari that takes almost 12 hours to cook. For the first few hours the Nihari is cooked on low flame in a large vessel followed by smoking of the dish, popularly called dum for 3-4 hours. The preparation for Nihari served at the restaurant in the morning starts the previous evening and takes the entire night to cook. 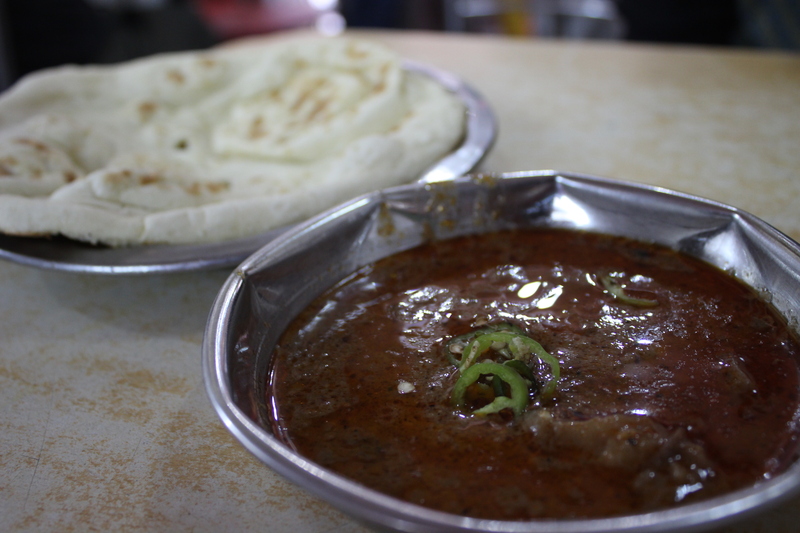 Served with Khameeri Roti, the Nihari at Bilal proves to be a hearty meal priced at only Rs. 45. Topped with fresh green chillies, the Nihari has tender, succulent pieces of meat in viscous gravy, which is not very spicy. The Khameeri roti is made with Rawa Maida and has a slightly different texture as compared to the regular Tandoori roti. The best part about the Nihari is the boneless pieces of meat that taste delish with the roti. This meal is so fulfilling that the Nihari gets over by 4 pm every day. The restaurant was established by Mr. Mohammed Bilal in 1990 and has been serving lip-smacking chicken and mutton dishes to its patrons since. 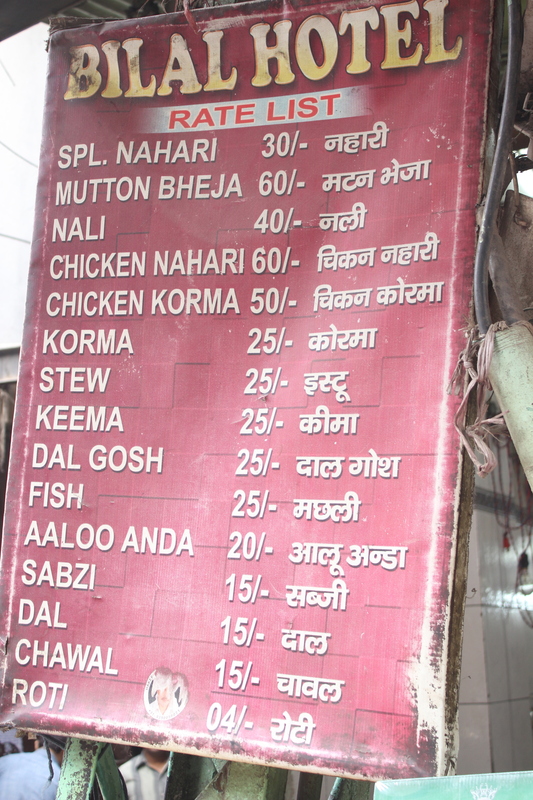 Just as Nihari, chicken korma and beef korma are two dishes equally appreciated by the locals. Every meal is very economically priced providing an extraordinary culinary experience for a reasonable amount of money. Thus, this joint is bliss for mutton lovers. Japan’s Hanami festival celebrates the ephemeral season of cherry blossoms. Guppy by ai, the most celebrated Japanese restaurant in Delhi, recreates the magic of the Hanami Festival (25th April to 30th May) through its dishes by introducing a special menu that captures its essence. Known for his culinary expertise, Chef Vikram spearheads the kitchen at Guppy by ai. Away from the sweltering heat of Delhi, the food journey started with cold sweet Corn and Avocado soup, enriched with soy milk. The soup is served with salt and a slice of lemon, which adde a distinct texture to the soup. It is truly refreshing. The menu has been thoughtfully curated with soups and salads as special vegan dishes. The 3 melon salad with Yubari, musk and watermelon looks simple yet the umeboshi plum dressing makes it truly delicious. Umeboshi are fermented pickles made from young, barely ripe ume, a sour Japanese fruit that’s a cross between an apricot and a plum. Japanese food would be incomplete without Sushi and Sashimi. For me, the highlight of the menu is the Mango and Avocado Cream Cheese Roll. 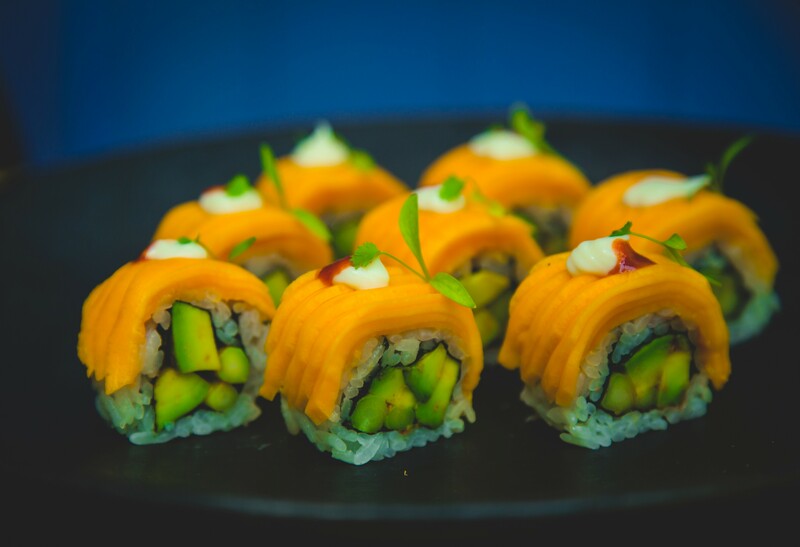 Made with Alphonso mango, cream cheese, tanuki tempura fritters and kimchi, the roll is unique and flavoursome. The roll also has a similar variant with tuna. Another king size roll was the Hanami thick sushi roll combined with black and white rice with sakura dembu, tuna, salmon, crab, yellowtail and cucumber. In the cold noodles – the 3 different variants are cold hiyashi tantanmen (home-made ramen noodles, served chilled with sesame flavoured pork broth, spicy ground pork meat and fresh vegetables), Hiyashi tanuki cha saba (chilled green tea flavoured buckwheat noodles, topped with tanuki tempura fritters, wasabi, grated radish served with a soy flavoured dashi broth. The Hiyash tanuki cha saba is the only vegetarian option in the noodles menu. The third option is Hiyashi somen (Japanese, thin angel hair wheat noodles topped with crab sticks, prawns, seaweed, cucumber and melon, served chilled with a ginger flavoured dashi broth). The Hanami cocktail menu has excellent refreshing cocktails like Sendai a mix of vodka, fresh kiwi, fresh melon and lime. Plum Blossom made with sochu, umeshu fresh plum and lime and Umetini with ingredients like sake, umeshu and gold leaf. 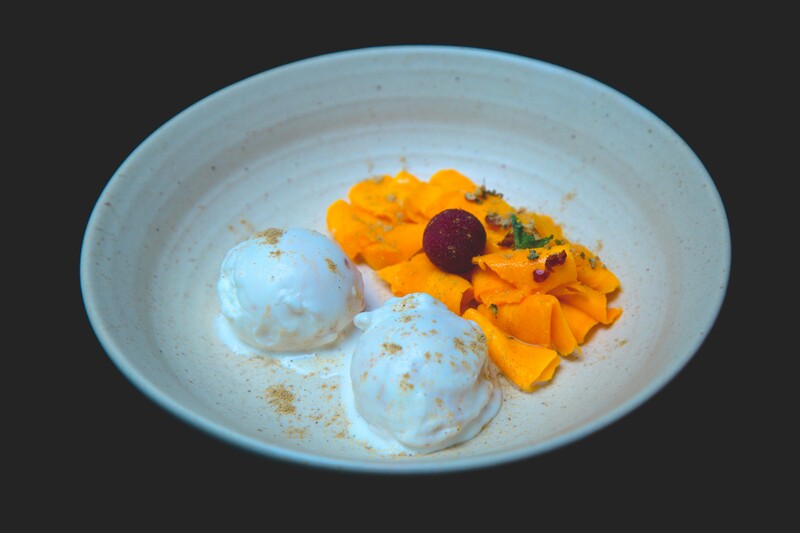 The food journey ended on a Mangolicious note a dessert with fresh Mango, liquorice and coconut ice-cream! Summer in New Delhi is hotter than ever this year. With the scorching heat comes the temptation to indulge in food that reminds us of breezy beach locations, refreshing getaways and fun fruity delights. Pizza Express brings all these together in one special summer menu – ‘The Hawaiian Pizza Express’. What began as a fascination for the Italian cuisine and the desire to bring the delicacies to UK, has now become a global favourite for distinctive Italian recipes. Always experimenting with exciting recipes, Pizza Express has truly won hearts with their recent menu this summer. From refreshing cocktails to unique meaty delights, the new summer menu covers it all. The first drink I tired from their menu was Molto Berry, which was a perfect concoction of mint and berries modelled into an icy paradise. What followed was even better. The next thing I got my hands on was the Lamb Polpette. Polpette simply means large meatballs and the dish was made with meatballs cooked in tangy pomodoro sauce served with freshly baked dough sticks. The first pizza I tried was Gambero, a crispy romana base topped with passata, yellow bell peppers and prawns marinated with Indian spices. What made this pizza an instant success were the fresh and nicely cooked prawns that topped the pizza. Pineapple on pizza? Sounds exciting right? The pizza that was the absolute highlight of the party was the Hawaiian ‘Pizza Express’ pizza. 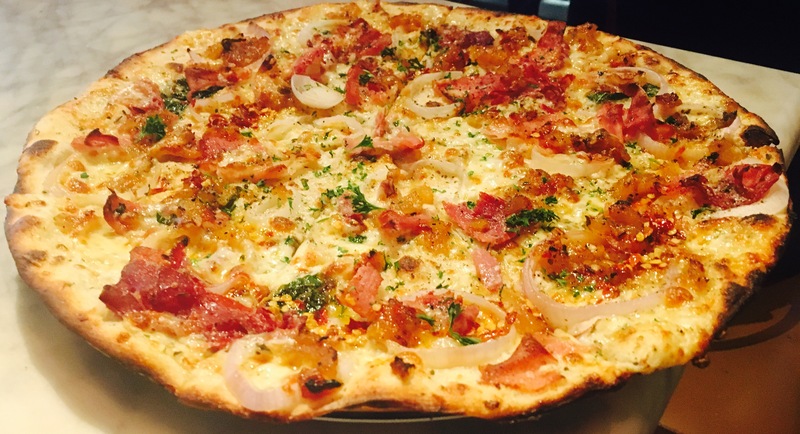 Topped with sweet pineapple chutney and béchamel sauce, this ham pizza was definitely one of a kind. Yet another pizza on their new menu is the Pollo Cajun, which is made with Cajun sauce, Cajun chicken and finished with the perfect sun dried tomatoes one can ask for. A unique component in this rectangular pizza is the Emilgrana cheese, a type of hard cheese with a granular texture. The new menu has got something for the pasta lovers out there too. Their Linguine Cajun Gambero is rich and creamy pasta made with prawns in Cajun seasoning and sun dried tomatoes. The visit ended on a sweet note with fresh banoffee pie and baked cheesecake. The banoffee pie was utterly delicious but for me the cheesecake stole the show. And with that sweet note I was left with a content heart and this summer got much more exciting with this stimulating Hawaiian menu that Pizza Express just introduced. Forever on the lookout for quiet places to relax and unwind, I can say this with confidence that Majnu Ka Tila fits the bill to perfection. As a city, Delhi is known for its glitz and glamour, swanky malls and polished restaurants. But the Tibetian colony in Majnu Ka Tila breathes a life of its own. Every time I visit this place, I am struck by the serenity of the atmosphere, rhythmic pace of activity and the kind smiles of monks that you are sure to cross paths with. One is overwhelmed by the sights, sounds and smells of the area. It is a treat for the senses. On one of my solitary walks from the monastery in vicinity, I stumbled across Kham Coffee House. 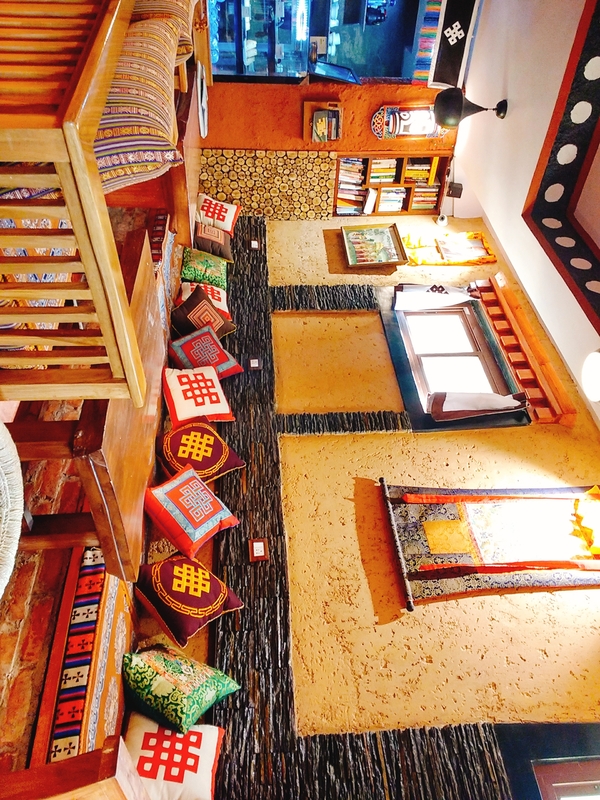 Nestled in one of the narrow alleyways that Majnu Ka Tila is famous for, it is a quaint and cozy little café. The décor is quite similar to that of AMA Café, one of the more popular cafes in this area, though it is not as spacious. Bare brick walls, tree stump tables and upholstery with Tibetian motifs constitute the interiors. As with other cafes in the area, there are well stocked bookshelves which you can raid while sipping your daily cuppa. The café exudes warmth and comfort. The menu is quite expansive ranging from teas, coffees and mocktails to fresh bakery items like muffins, cakes and pies. 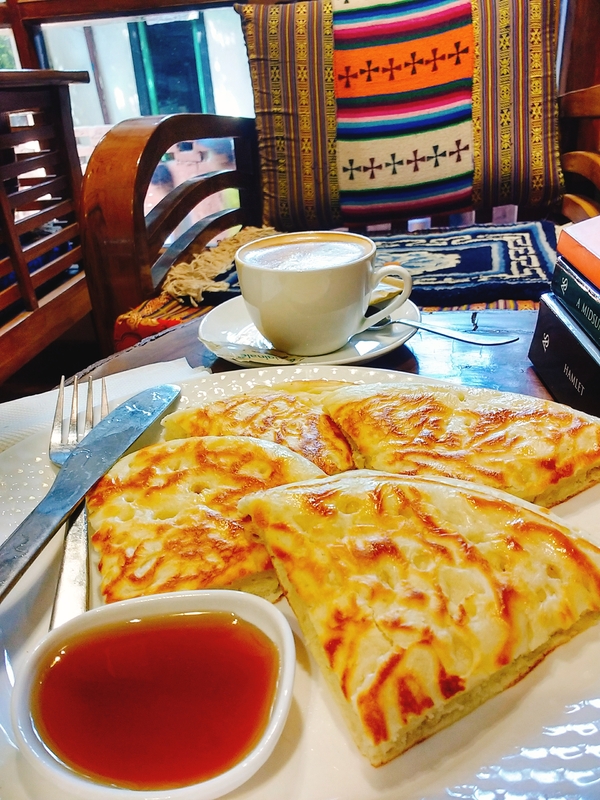 They also have all-day breakfast options like pancakes, omlettes, Tibetian bread and a complete American breakfast platter. I went for a Cappuccino and Pancakes. The coffee was good, nothing exceptional. The Pancakes served here were unlike any that I’ve had till date. They were extremely fluffy (almost the breadth of your index finger!). 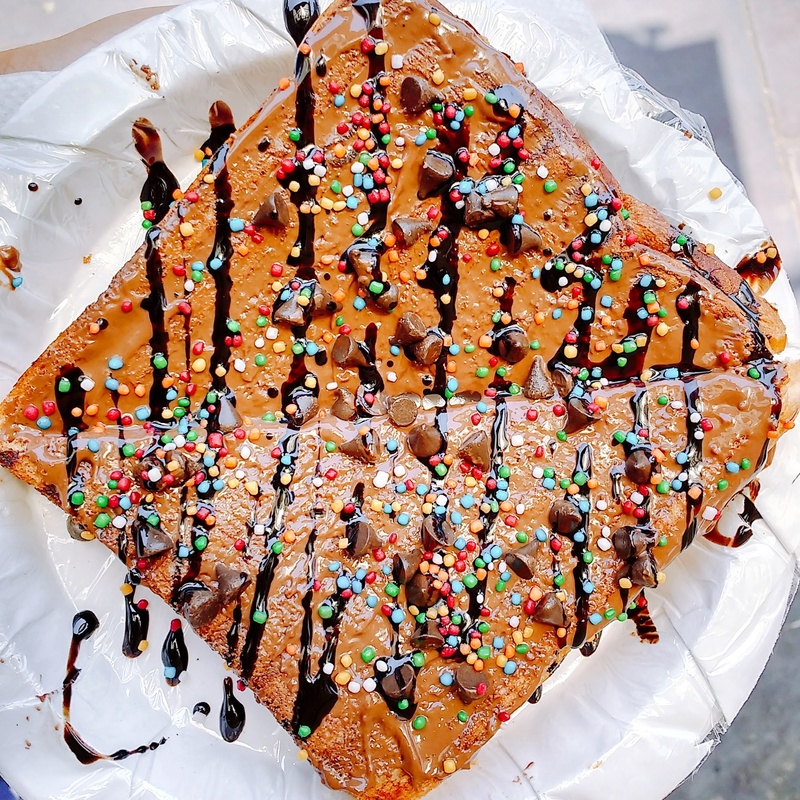 It was divided into four triangular pieces and served with Maple syrup. Two triangles down and I already felt full. The surface resembled that of an omlette and in fact it even smelt like one. My only problem was that the cutlery felt a bit unclean. The forks, knives and spoons felt sticky and this dampened my experience a bit. Though the cooking and washing area wasn’t unhygienic, the washing was being done in a hurry which perhaps caused the problem. A place perfect for all occasions, Kham Coffee House deserves a visit. Atleast go for their Pancakes and ambience! Connaught Place is not only a favourite amongst Delhiites, it is also a well known and talked about attraction all across India. Its reputation is backed by a multitude of restaurants, cafes and clubs which offer a variety of food and beverage options. In a buzzing hub like Connaught Place, hundreds of restaurants open and shut down each year which encourages restaurant owners to come up with unique ideas. An astounding opening that hit Connaught Place earlier this year has to be 38 Barracks, located in M-Block outer circle. The brain child of Mixologist Mr. Kumar Sambhav and Chef Mr. Gautam Chaudhary, 38 Barracks is a true marvel both in terms of its concept and the food it offers. Inspired by the achievements of a real-life colonel, 38 Barracks pays homage to the glorious army life. The walls are decorated with real guns, rifles, trophies and medals of the colonel. There are also black and white pictures of the army giving the customers an antique and historical feel. Most of the items on the menu are named in military style going well with the concept of the restaurant. The food at the restaurant is exceptionally sumptuous as well as fairly economical. The restaurant offers a wide variety of delicious vegetarian and non vegetarian dishes. Among the vegetarian starters, I had the chance to try their Paneer Tikka Barrels. Cut innovatively in the shape of tiny barrels, these tikkas were full of Indian flavours which might be a little spicy for some. The tikkas were served with a small glass of a palate cleanser to wash the spices down. While skin platter is an absolute delight for all potato lovers like me, another fun starter to try is their Soldier’s Mirchi Wada which is served with fresh vegetable salad and two different dips. On the other hand, the non-vegetarian menu was very extensive catering to different cravings. For those who prefer fish, Clash of Clans is a must try. 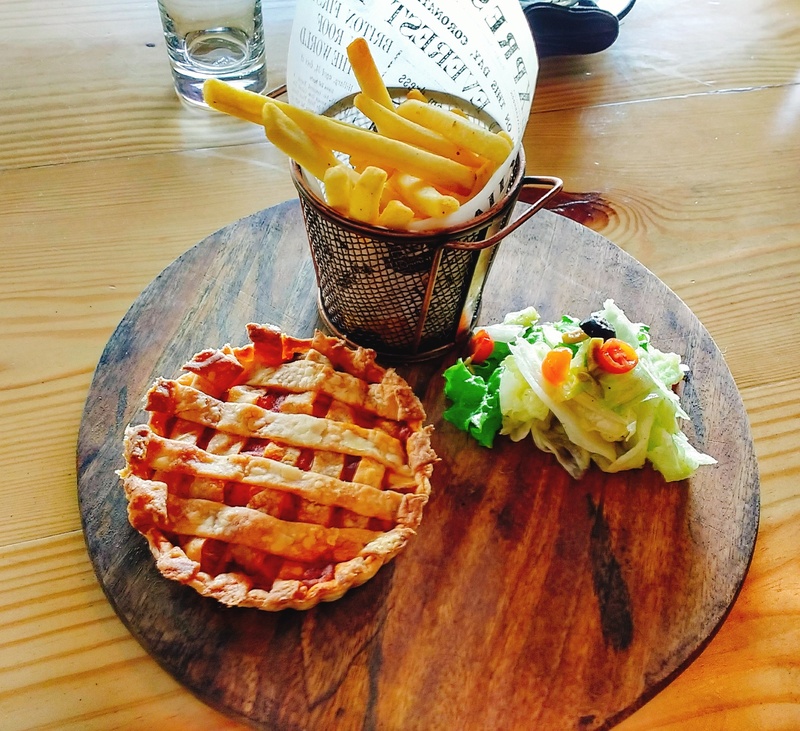 It is a platter that offers two completely different fish items, one being the English favourite fish and chips and other the Punjabi achari fish tikka. However this unique combination is topped by their unilateral grilled Salmon, the dish I absolutely fell in love with. It is a salmon fillet grilled from only one side for a long time letting the heat cook the entire fish slowly. It is served with baby potatoes and grilled vegetables that compliment its flavour extremely well. 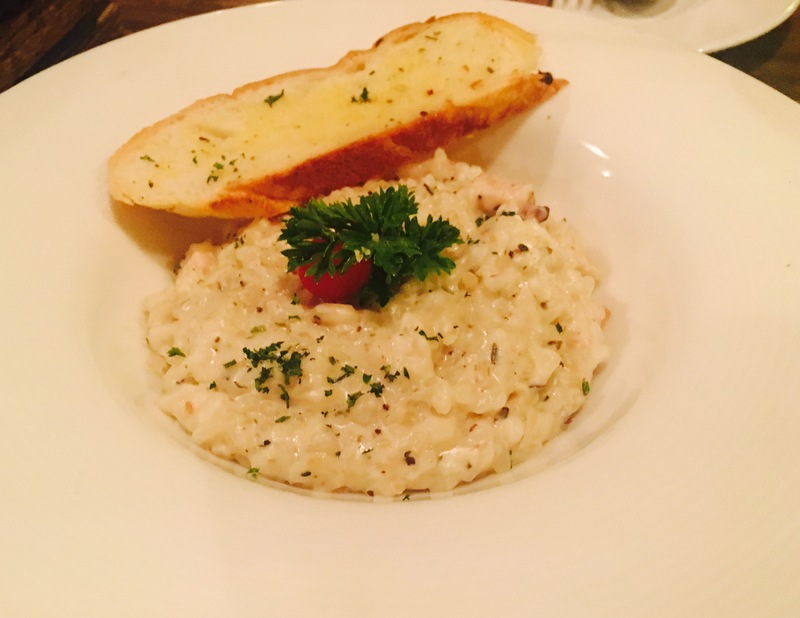 For those who crave chicken, the smoked chicken and scarmoza risotto is to die for. It is very rare that someone nails a risotto but this was perfection! Apart from the lip smacking food they offer, the cocktails at 38 Barracks are not to be missed out on. Aside from the huge variety of cocktails on their menu, they also make custom cocktails with the freshest of ingredients like seasonal fruits. For those who like a sweet sip, their mango margarita is a must have during summers. Overall, my experience was amazing and I definitely recommend this place to all the readers. Deep dish American styled pizzas have been a major part of our diets since the various fast food chains entered the Indian Market. There are also high end Italian restaurants that serve quality pizzas in Delhi. But for someone looking for simple, rustic Italian food at an affordable price, Jamie’s Pizzeria should be a definite stop. UK’s favourite celebrity chef, Jamie Oliver launched Jamie’s Italian and Jamie’s Pizzeria in Delhi last year. And within a few months a new outlet of Jamie’s Pizzeria opened up in West Delhi, paying heed to the popular demand. As Jamie Oliver promised, the restaurant offers simple yet delectable Italian pizzas made with the freshest ingredients. The Neapolitan style base of each pizza is made with hand kneaded dough which is prepared thrice in a day. The dough is hand stretched into a thin base followed by pomodoro sauce and fresh vegetables which are layered on top, before the pizza is baked. A new addition to their menu is the Jamie’s Super Greens pizza, which is a true delight for vegetarians. The thin crust of the pizza compliments the green vegetable toppings and instantly melts in the mouth giving way to the flavours in the herbs and vegetables. For the chicken lovers, the Chicken Alla Diavola pizza is a must have. The pizza is layered with Jamie’s secret chilli sauce and jalapenos that add a spicy twist to it. Jamie’s Pizzeria is one place where every pizza is equally scrumptious and the secret lies in the way their base is prepared. The menu is not limited to only pizzas. The hand-stretched garlic bread with cheese that comes with the Olive Tapenade is another item on their menu which is not to be missed. All three dips at the restaurant are absolutely delicious and unique but my favourite has to be their secret chilli sauce that goes well with everything. The homemade iced tea on their menu is unlike iced teas at most other joints. It is not only low on the sugar; it also has a strong brewed taste of the tea which I absolutely loved. 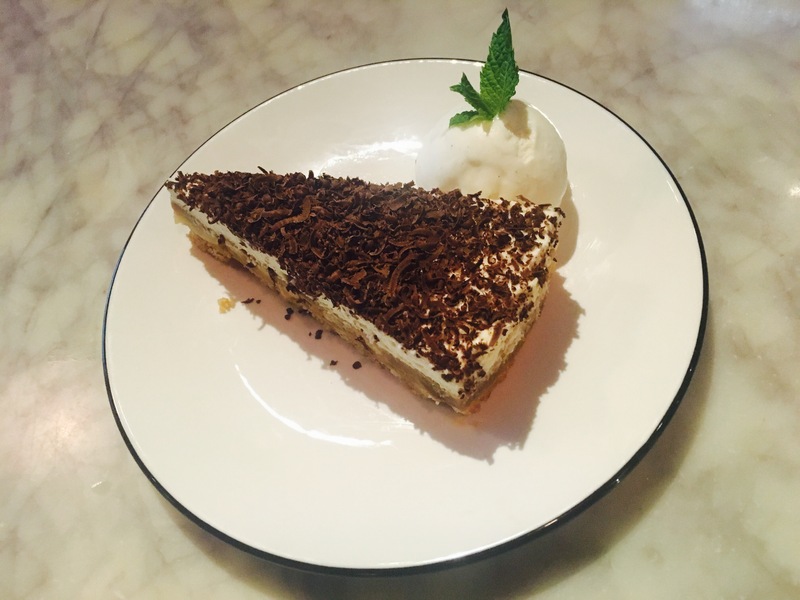 For desserts, we tried the seasonal almond tart with vanilla cream which was topped with fresh mint leaves. It was the most beautiful dish to look at and has to be the highlight of the visit. The tart is so soft and fresh that it melts in your mouth instantly and leaves a yummy almond flavour behind. Overall, Jamie’s Pizzeria is a jewel of a restaurant. It is undoubtedly a value for money and a great stop for some rewarding food. Delhi, being the capital metropolitan city, serves as the centre for political, commercial and international movements. With the ever growing network of trade, the spirited and ambitious society is continually affecting our lives. Every hard working individual wishes for a peaceful getaway once in a while, to relieve the everyday stress that this competitive culture builds. Recently, LemonTree Hotels inaugurated their first resort hotel in Delhi NCR at Tarudhan Valley Manesar, providing a perfect weekend getaway destination. With unmatched facilities sprawling across 72 acres of manicured lawns, the resort is a marvel of magnitude located in the lap of Aravalis. In addition to a variety of contemporary rooms designed to suit all experiences, the resort offers a 9 Hole Golf course adding to the leisurely experience. The enthralling experience is made better by facilities like a lap-size swimming pool, a Kids playing zone, an Archery range, a revitalizing spa by Tattva, a restaurant overlooking picturesque landscape, and various game courts and outdoor activities. The resort also offers a separate banquet area with three large conference halls ideal for a variety of events including weddings. The themed bar and restaurant, Skinners, offers an enticing buffet to its guests with unique appetizers, elaborate mains and fresh desserts. Mere 40 minutes drive from Ambience Mall in Gurgaon, the resort is a perfect destination for a getaway with friends and family. The resort presents three types of rooms, deluxe, executive and studio apartments in Villas facing the golf course to its varying customer base. Each room has a beautifully designed outdoor seating area, ideal for visits during the winter. LemonTree Hotels are one of the very few chains in the country that train and employ differently abled workers, firmly believing in equal opportunities. With 15% of their employs falling under the differently abled category, LemonTree Hotels is the only Indian brand that aims to increase their employment to a total of 40% by 2020. 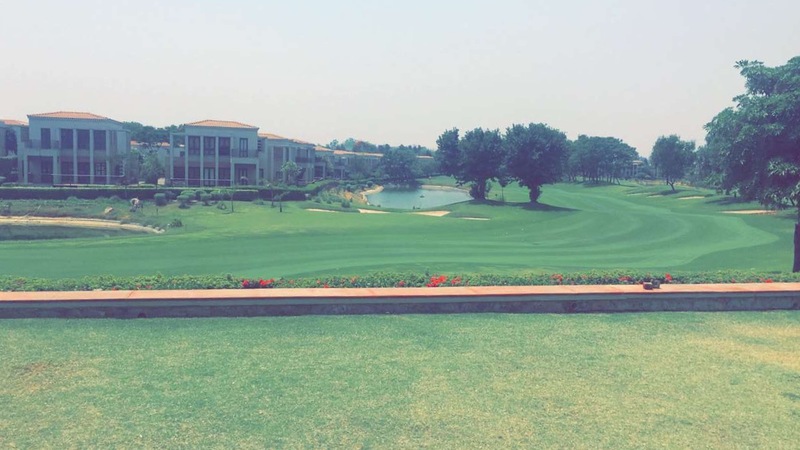 For years, LemonTree has been one of the best business hotel chains and now it has ventured into leisure resorts and their golf resort at Tarudhan Valley, Manesar is a true spectacle of magnificence. My experience at the Tarudhan Valley resort was super exciting. It was the first time that I got to try archery, which I must say is more difficult than it seems. The highlight of the visit for me was the lunch buffet, though. It had an array of beautifully dressed appetizers which tasted even better. The one that I absolutely loved was their Mushroom and Asparagus salad. The resort is perfect for some post-lunch putting, which I also got to try. Overall, my experience with the resort was wonderful and I’m definitely visiting again.